Discussion in 'UFOs, Aliens, Monsters, and the Paranormal' started by Mick West, Jun 21, 2017. A documentary from Gaia.com claims that what looks like a mummified corpse is evidence of a new species, possibly of extraterrestrial origin. Now several red flags pop up. Most immediately that Gaia.com has a history of creating videos promoting the idea of ancient aliens, none of which panned out into actual evidence. But what of the mummy itself? It's claimed that it was found in the Nazca region of Peru. This makes some sense as similar human mummies have been found in the region (which is very dry, and so bodies protected from the elements are naturally preserved by drying out). The nearby site of Estaquería may provide clues to the remarkable preservation of the numerous bodies in these cemeteries. At that site, archeologists found wooden pillars initially thought to have been used for astronomical sightings. However, it is now believed that the posts were used to dry bodies in a mummification process. This may account for the high degree of preservation seen in thousand-year-old bodies which still have hair and the remains of soft tissue, such as skin. Among the bodies found at the Moqi tomb complex is a middle-aged man who researchers believe to be ethnically Incan. So what is this three-fingered mummy? I can think of a number of possibilities that I'll give it what seems like the more likely order to me. Very old fake, actually mummified, but made from human and animals. Jaime Maussan is a UFOologist - a journalist well known in UFO circles as someone who hypes evidence-free claims of aliens, etc. He appears to be the person who led Gaia to the mummy. For over 6,000 years humanity has not been alone. Inserting themselves into positions of power and using subtle means of manipulation, off-planet rulers (the Archons) have been guiding our history for their own gain. Their greatest fear is that we wake up and wrest control away from them by taking responsibility for ourselves. Jay Weidner reveals who these Archons are, how they retain power and what we can do to escape the Archon trap in this interview with George Noory originally webcast June 16, 2014. Dr. Konstantin Korotkov appears to only be an expert in pseudoscientific topics like a form of Kirlian photography, which he uses to investigate the physical manifestation of the soul leaving the body. Dr Jose de Jesus Zalce Benitez has worked with Maussan before, most famously with "Roswell Slides", where he performed extensive analysis of a photo that he said was of a non-human body at Roswell, but which turned out to be a mummified child on a museum shelf in South America. So he does not have a very good track record. M.K Jessie appears to be a real radiologist but really gives very little information other than saying that based on the small images she has been given she think it's unlikely to be a modified human skeleton. Natalia Zaloznaja (probably better transliterated as Natalya Zaloznaya, Наталья Залозная) - the supposed "head of image analysis" may well be a real doctor, but does not say anything of note. So simply based on the track record of the people involved, I would have to put "fake" as the most likely explanation in the absence of additional independent evidence. in which a Doctor Edson Salazar Vivanco examines some small strange looking mummies and a three-fingered hand. Vivanco also appears in the Gaia piece, in a (currently) non-speaking role. He's on the left, with Benitez on the right. I used to do a lot of work in ceramic sculpture, and that is honestly what I thought this was at first glance. 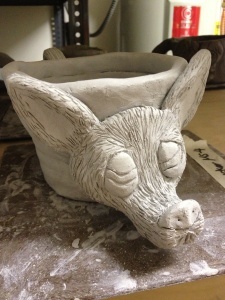 It looks exactly like clay does when it reaches its fully dry state, before being fired in a kiln. We even call that state 'bone dry'. There's a lot of dust created during this phase and it can often flake off onto the surface which the piece is resting on. Here's an example found online of a bone-dry piece of pottery, with residual dust, dried bits of clay, and flakes on the board which it is resting on. Now, plaster can look the same way. When I look at the creature's skin, it looks like someone could easily have taken paper or cloth of some sort and painted it with a very wet, liquid clay or plaster called 'slip' by ceramic artists, placing it over an armature or form to create the appearance of wrinkled, desiccated skin. For the bones and armatures, I think they painted over something darker, perhaps metal? There are areas on the toes where you can see the thin outer "skin" flaking off, and see the dark material underneath... Certainly not bone, unless aliens have dark bones. This would be really simple to make, a difficulty on par with a middle school art class's papier-mâché project. For the bones and armatures, I think they painted over something darker, perhaps metal? The do show a CT scan of the mummy, which, if genuine, does suggest they are actually bones. Things that strike me as particularly fake looking are the face, which looks like it has been sculpted from clay. Here there seems to be a "cuff" where the more human looking arm ends, and the more alien looking hand begins. If I wanted to fake such a thing, I would use a real human skeleton (and preferable an actual real peruvian mummy, of which there are probably still many in undiscovered graves) then add fake hands, feet, and head. The Skull is interesting, as from the x-ray shown it looks like a real skull, but oddly shaped. However cranial modification in humans are not unknown, and many far odder shaped skulls exist. Skull binding has nearly died out, but still exists. Getting an odd shaped skull would not be impossible. In Africa, the Mangbetu people of north-east Democratic Republic of the Congo also practiced head elongation. Babies’ heads were bound with cloth to create the desired shape. As adults, the effect was emphasised by wrapping the hair around a woven basket frame so that the head appeared even more elongated. The first thing to notice is the Cuneiforms. There's a matching Medial Cuneiform that normally support the Metatarsal (I) of the big toe. Howeever this is missing, and we have what looks like the three middle toes, but on a bone structure that normally supports five toes. This suggests a largely normal human foot (note the shape of the ankle bone) with the big and little toes removed (or possibly genetically missing), then the three middle toes separated all the way back past the metatarsals. Similarly one might create a long three-fingered hand by removing the outer two digits and then splitting the flesh down between the metacarpals which are normally inside the hand. of course I'm having a hard time flipping this xray in my head (my spatial issues).. the overlapping foot is backwards on the xray.. can xrays flip feet...or am I just confused because of my spatial glitch issues? Genetical abnormality is a possibility, however I'v not found any abnormality that leads to missing a thumb and little finger so neatly. There is however the condition of Arachnodactyly which can lead to abnormally long fingers. I don't think it's particularly likely, but if you wanted to create a very odd hand skeleton with genuine human bones, you could remove the outer finger and thumb from someone with Arachnodactyly hands. That Xray is rotated. The mummy's right root is the one with widely spaced toes. Good points. It was mainly the skin tone that screamed 'fabricated' to me, since it's all the same white tone and texture and on real Incan mummies, it varies based on a lot of different circumstances, like the presence or lack of clothes, the parts of the body that were laid on the ground versus exposed, etc. Skeletons are pretty easy to get, even if they didn't get an actual mummy. A medical skeleton would work if they had to find one, or perhaps a skeleton of a large primate. Point is, it could be a looot of things. I have worked in sculpture with both clay and plaster, and the object in question seems to me to be a fake coated in some ceramic or plaster-like material, and NOT mummified skin. Thierry Jamin gone to Nasca, to present his mummies to people working in tourism. I'm sadly lacking in Spanish, so I'm going to post these videos in the hope someone can extract some key information, like a quote from the director. To add to the pile on re it being a fraud--actions speak louder than words. If the people who are claiming to have discovered this mummy believe they have the most important scientific discovery of all time, they certainly aren't acting as I would expect them to. Instead of having the discovery verified by one or more of the dozens of top-flight research universities that would gladly donate their resources to be a part of such a ground breaking discovery, they instead made a cutely-edited video and a click-baity viral video campaign. What verification? They didn't even prove or support their claims with any scientific paper or written record, AFAIK. All those people have is faked mummy and they are trying to keep it that way. Even their presentation of the mummy is too much commercial considering the claim of discovery. No discovery photos, videos, nothing. Only some dubious X-ray images, supposed DNA testing, Carbon dating but no papers. No proofs whatsoever! This mummy should be stigmatized currently with fake. The so-called Nasca mummies, are the product of the modification of real mummy remains illegally extracted by local grave looters, also known as ‘huaqueros’ from the province of Palpa, in the Ica region of Peru. The stolen mummies from archaeological sites constitute an attack against the cultural heritage of Peru. The informer in the video, known in the area as 'El Pijo' exposes the activities of 'Mario' before and during the elaboration of the mummies. In the video it’s revealed that 'Mario Peruano' used remains of unborn children and llama fetuses, stolen from archaeological sites, it is also revealed how they manipulated the skin and modified the bodies at a local workshop. The dead body is re-coated, they put it in water and it becomes flexible... You can stretch the neck, pull the throat and insert another one. It's stretched, and that's how the make longer neck". I do speak Spanish and am a regular veiwer of Maussan's show in Mexico. He did four specials or special reports on these mummies from the tiny ones to the three bigger ones. Not gaining much coverage was the presence of gold inside some mummies in the chest and wrists. It shows up in early coverage Xray shots. I would assume placed after death as it would have impeded movement. And later no mention. Very odd. The small ones are all different bone structure and one has no knees. One bone hip to foot. Again very odd at best. The coatings include diatomacus (sp?) earth and other local Peruvian materials all of which are thickly applied and undatable. Probably a very important detail. No one is permitting any intrusive investigation citing a need to preserve these treasures. They say dna testing was done and results were non human. But again no proof offered. Thus just a claim. Quite frankly the small ones appear constructed and a huge archeologic error in authenticity is something Sr. Maussan never notes. None were found in situ and no one wants to find the site. To me that says there is something rotten about the entire 'find'. Sunday on Tercer Millenia with Jaime Maussan he was thrilled to make an announxement. The mummy finds and all scientific data was being presented to the congress of Peru to help pass a bill making them legitimate historic treasures. Today at 7:30 am Chicago time. Press conference at noon. The head of Peruvian antiquities was never mentioned. He ceased to matter in this affair. The no knees mini mummy has gone from the offerings. Only the two with knees were presented. Most finds are automatically historicilly significant and do not require an act of Congress to be accepted. Only the usual gang Mick noted above were shown in a blurb-suggestion of alien source-and flit off to a new blurb before one could question the claim fashion. Very difficult to follow actually. Very distracting. All in all a rather unusual way to get recognition for a find of wide ranging carbon 14 dating artifacts admittedly sold ny a tomb robber. No mention of if recognised they go into care of the government or stay with current owners. Whom in their own videos treat them like random crap on a table at a swap meet. If in gov care the official head of archeology has unlimited access unlike now. And he distrusts the current owners and explanation. Very odd turn of events.